Thomas Agre never thought he would cheer on the Milwaukee Bucks and Green Bay Packers from the band section of nearly every game. 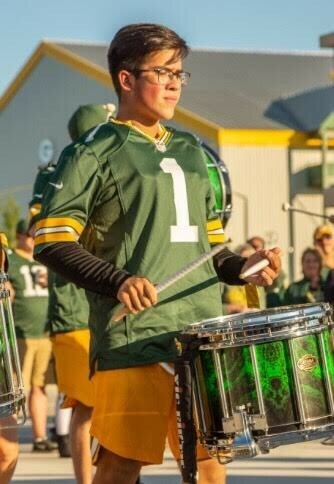 Agre, a senior at West Bend West High School, plays the snare drum in the Milwaukee Bucks Beats Drumline and the Green Bay Packers Tundra Drumline. Agre joined these groups only a few months ago. Bucks Beats Drumline is part of the Milwaukee Bucks Entertainment Network and they perform at Bucks basketball games and various other events in the Milwaukee community. Similarly, the Tundra Line Drumline performs at every Packer game. Thomas Agre at Lambeau Field in Green Bay Sept. 9. Photo courtesy of Eric Schwierske. Agre is only one of two high school students in both Bucks Beats and Tundraline. Both organizations require an audition and an application process to ensure all members are qualified for the difficult music. After being accepted to the Bucks Beat Drumline, the rehearsal schedule also proved to be quite demanding. Agre was inspired by Duwayne Davis, who got involved in both programs while he was still attended West Bend East High School. Davis graduated in 2017. Davis felt like Thomas was qualified to participate in both groups and encouraged him to apply. Agre started playing percussion in sixth grade, but began playing the snare drum his sophomore year. Band director Leah Duckert-Kroll watched Agre’s progression for years as Ben Kroll, a former East student, taught Agre during his ninth grade year. Agre has been involved in numerous other drum lines including Sun Prairie Marching Band, Colt Cadets Drum and Bugle Corps, and Shadow Indoor Percussion. Agre plans to continue this hobby throughout college even if he has no plans to major in music. All of Agre’s hard work and dedication does not go unnoticed. “Thomas has a real passion for music and it shows through his talent and his willingness to work hard,” Davis said.